Beaver Lake – This lake northwest of Hurst Lake, like many of the lakes and ponds on the property, was formed by a beaver dam. Holland Lake – Named for James Holland, one of the earliest settlers in the Haliburton area. Hurst Lake – Named for Fredrick C. Hurst, first Chairman of the Haliburton Camp Committee and dedicated to his memory on August 5th, 1956. One time site of a cabin built by the 194th Rovers and a composite site for two summers in the 1960’s. Muriel Lake – North of Kennaway Road (north of East Bay), it was named after Muriel Moore, wife of J.C. Moore. North Lake – Obviously named for its location on the north boundary of the camp. Anii Shores – Means welcome in Ojibway. Beacrobra – Named after the Beaver, Crow and Cobra patrols of the 155th Toronto. Bedford Park – Opened by the 179th Toronto Troop from Bedford Park United Church. Big Bear – One of the first campsites. Named because a bear was sighted there on the first year. Also said that on the map (see above), it looked like a bear’s head. Birch Point – Named because of the large number of birch trees covering it. Canoe Point – Reportedly named for the remains of a canoe found in the water nearby. Cedar Cove – Located in the cove south of Cedar Steppes, it was covered in cedar trees. It was very buggy however and was abandoned in the late 1980’s. Cedar Steppes – Opened to replace Cedar Cove, this cedar covered site has several levels, hence the “steps”. Chippewa Point – Chippewa was named by the “Senior” Scout Troop of the 73rd Toronto group under the leadership of Mr. Howard “Beans” Harpur. Doe Island – The smaller of Doe and Buck Islands, these were the biggest islands in Kennabi Lake and were probably the first to be named. May have been named for the deer stranded there in the spring. East Bay – Named for its location, it was first camped on by the 197th Toronto Troop. Today it is used as an access route to the rifle and archery ranges located just above the old campsite. Gohe Point – Named after Gord, Orville, Harold and Eddie who were from the Lithuanian Rover Crew that opened the site in 1950. Hidden Bay – Because it was in Hidden Bay! Indian Point – Named by the 40th Toronto Troop for the remains of an old Indian birch bark canoe which they found when they first camped there. At some point it was abandoned as a campsite until being reopened as Waconda Point in the 1990’s. Jubilee Point – Located west of Birch Point across from Canoe Point, it was opened by the 1st Centenary Rover Crew in 1977 in honour of the Queen’s Silver Jubilee. It was later abandoned as a site. Kingfisher Point – A reasonable theory was that a kingfisher was seen sitting on the point. Little Chip – Was originally a patrol site for Chippewa Point, but it eventually became a troop site of its own. Named by the 73rd Toronto “Junior” Troop under the leadership of Bill Henderson(59-61,80). Ojibway Rock – It was opened in 1951 by the 77th Toronto Troop under Harry Bruce. Pirates Cove – Opened by the 105th Toronto Troop under Scouter Gary Pepper. Raider’s Island – Where Don McLean and has bride honeymooned and were (who would have thought) raided! Rover’s Rest – Used regularly in the early days by Rovers although when being used by composite it was called Manitou. Sejur Heights – Named after the senior and junior patrols of the 155th Toronto Group led by Reg Roberts and Roy Ashbridge. Twister Point – Apparently a tornado had touched down on this point some years before the camp was purchased (c1943) and the results were still obvious when Scouting took over the property. Waconda Point – Good question – does waconda really mean lame chicken in Algonkian? Westview – Because it faces west obviously! Burnt Bay – Named as a result of a forest fire which had burned much of the shoreline along the bay before we purchased the property in 1946.Algonquin Island – Located in Mud Bay, it was named for…. Buck Island – The bigger of Doe and Buck Islands, these were the biggest islands in Kennabi Lake and were probably the first to be named. May have been named for the deer stranded there in the spring. Cranberry Bay – Pretty obvious in the fall! Haliburton County – Named for the Honourable Thomas Chandler Haliburton, Canadian author and Chairman of the Canadian Land and Emigration Company. Kennaway Road – Named for Sir John Kennaway, 2nd Baronet of Hyderabad and High Sherriff of Devonshire (in 1866), who was a Director of the Canadian Land and Emmigration Company which first bought the area to encourage immigration. 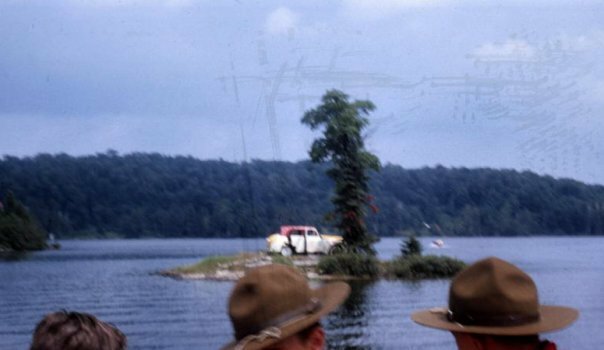 Loon Island – It was opened for camping in 1951 by Syd and Dory Young of the 40th Toronto Troop and named for the loons who continue to nest on the island. It later became the site for the snorkelling program. Mud Bay – Named for the shallow water and deep silt! Pikes Peak – Named after the Pike’s Peak in Colorado. The use of this name is noted as early as a February 3rd, 1950 Camp Committee meeting which discussed building a lookout tower there. Pine Island – Just east of Raiders Island, it was named for the pines which cover most of this island. Later became the site of the Survival program. Rhode Island – This island just off Sejur Heights was named for the 2nd Barrington, Rhode Island troop. This became a small (maximum 10 campers) in 2012. Raiders Island – ?… it later became the site of the camp chapel. Rowboat Bay – Located just east of the Hub, it is where the rowboats were stored each winter. Now better known as Kayak Bay because of the program which now operates there. Taxi Island – Formerly known as Turtle Island, it was renamed after an old taxi was left on the island one night. Turtle Island – Just south of Rovers Island… it also is known as Taxi Island. Wallace Creek – This creek crosses under the Kennaway Road at the entrance to the Hurst Lake Road, and flows into Holland Lake. It was named after a Camp Committee member, G.L.Wallace slid off the road and into the creek with his car. The steep rise which the Kennaway Road follows west of the Hurst Lake Road was called Wallace Creek Hill.